Statistics Canada released the 2016 Census population and demographic data on May 3, 2017. The following day CBC News online posted an interactive graphic based on that data. CBC’s goal with the graphic was to illustrate a critical issue facing the nation - our aging population. The Powell River Region covers an area of 5,092 sq km or 1,966 sq mi. and occupies the upper end of B.C’s Sunshine Coast north of Jervis Inlet. As the map below shows the region also includes a number of islands in the Georgia Straight most notably Texada and Lesqueti. 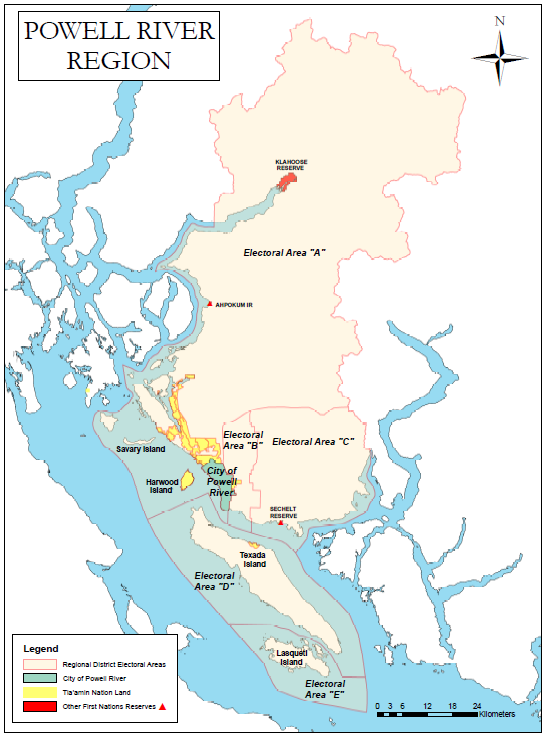 The Powell River region is divided into 5 electoral areas: A, B, C, D, and E which form the Powel River Regional District (PRRD); the City of Powell River; and, the Tla’amin (Sliammon) Nation lands. 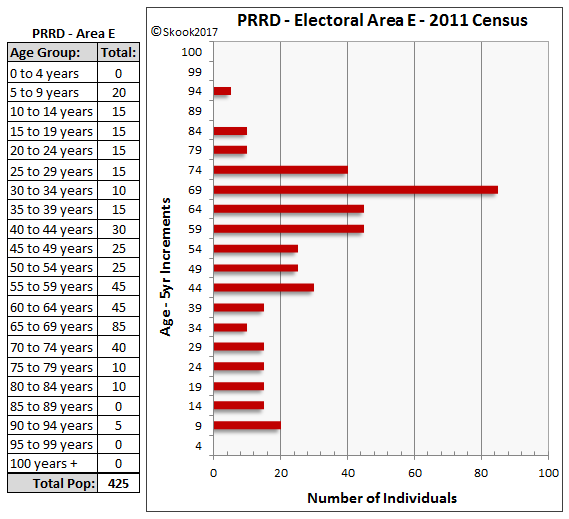 The 2016 Canada Census followed these seven divisions and the charts below were created from each division’s census data. Electoral Area D is Texada Island. Electoral E is Lesqueti Island. 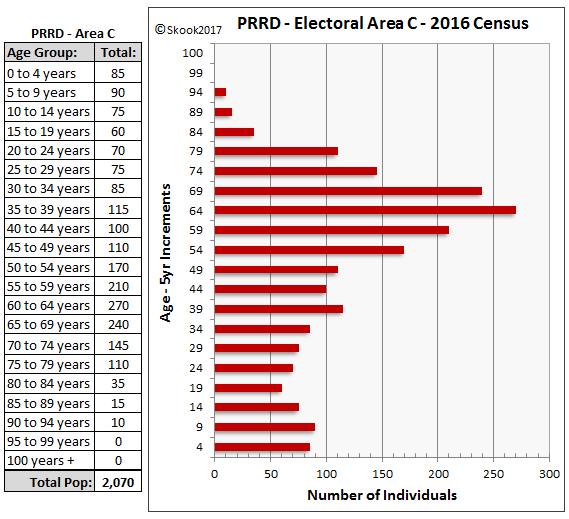 It needs to be noted that the 2016 census shows a total population of 399; however, Stats Canada felt the demographic breakdown was too unreliable to be included. 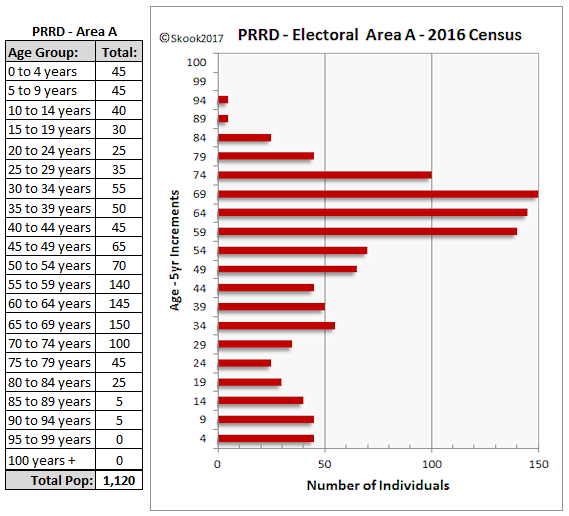 I decided to use the 2011 Census and if you image the data shifting up to the next age group it should give a reasonable idea of the 2016 demographics. Therefore, the 65-69 age group bulge moves up to the 70-74 age group. 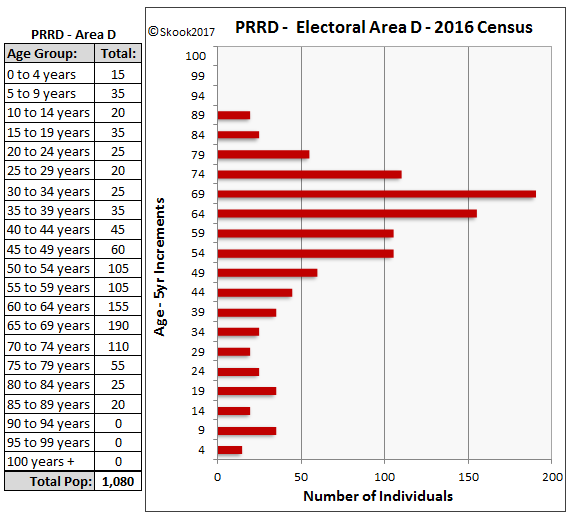 I have combined the populations of the five electoral areas to determine the total population of Powell River Regional district (PRRD). 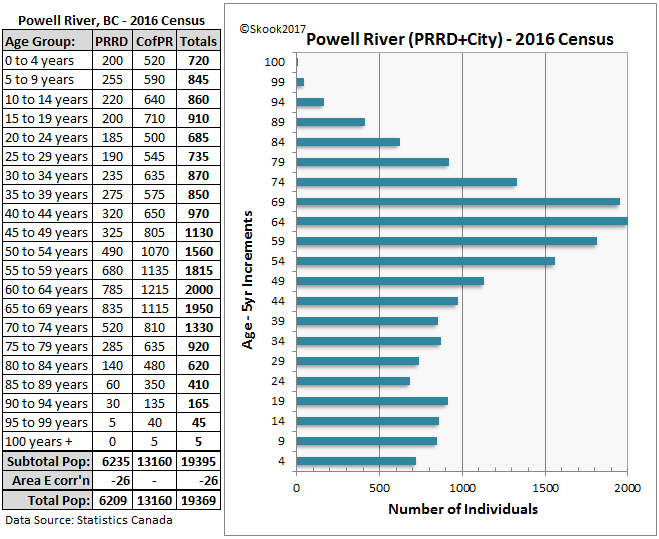 The 2016 census data for the City of Powell River. 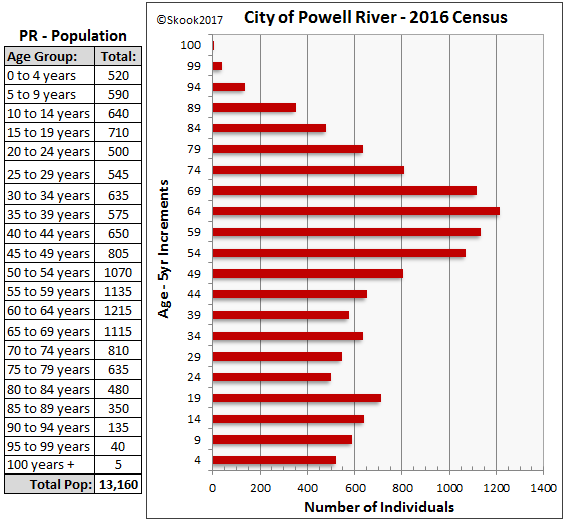 To determine the overall regional population, I combined the population of the City of Powell River and the Powell River Regional District. How do you explain that lower chart pattern? Here’s my attempt: as every female age group enters child baring age, they all get pregnant and bare children at the same time. It’s the upper end of the chart that we can note a difference - far fewer our first nation people in the region are living past 79 years. 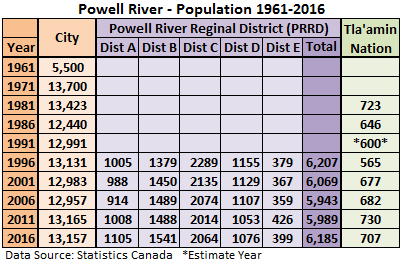 I have gone back as far as I can via the Stats Canada website and created the table below to show population changes in the Powell River region since 1961 (separate data for each PRRD area begins in 1996; the Tla’amin Nation first participates in the national census in 1981 and chose not to participate in 1991). 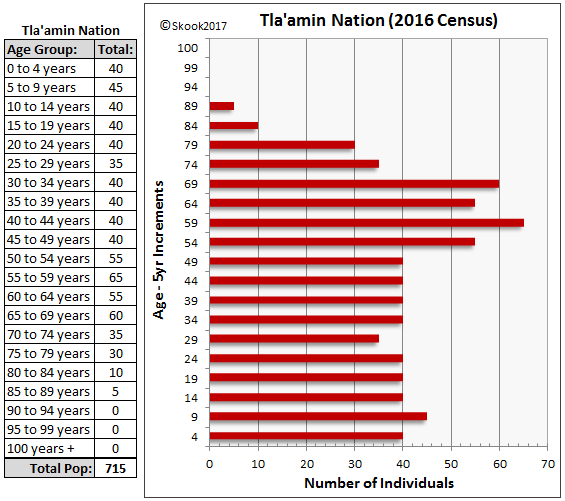 We see in the table from 2011 to 2016 the Tla’amin Nation population dropped by 23; the regional district population increased by 196; and, most noteworthy, the City of Powell River population barely budged (a drop of 8). So, overall, the population has more or less remained stagnate over those five years up to and into 2016. Now consider during the same period a total of 1566 residential homes changed hands. Is it not possible to infer that this real estate boom has failed to bring any growth to the region? 2016 had 417 residential sales, but I did not include them in that total because the 2016 Census Day was May 10, 2016. There may have been a rise in population from May to Dec, but if there was I’m guessing it wasn’t significant. I hope for Powell River’s sake I am wrong. I would like to return to that CBC table at the beginning of this post. 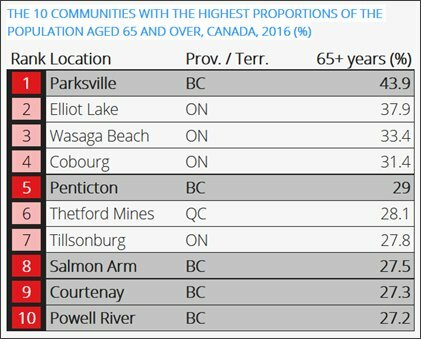 When I first looked at it I thought, “Wow, Powell River has an older population than Sechelt?” Well, it doesn’t. 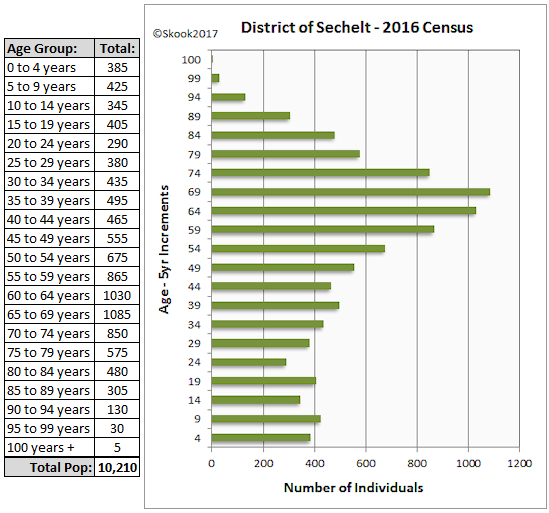 An incredible one third (33.8%) of Sechelt’s population is 65 years and older which would have put it in third place in the table. It didn’t make the list because it is a “District” as opposed to a metropolitan (City) area although it functions more or less as the latter. Here’s is one last sobering chart I just pulled from the BC Stats website. 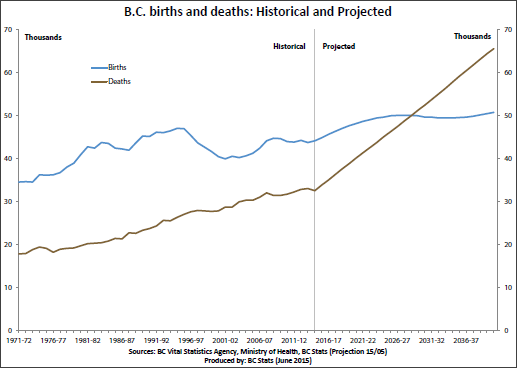 According to government projections, BC’s population growth vis-à-vis births and deaths will reach 0 in just ten years and then rapidly turn negative. 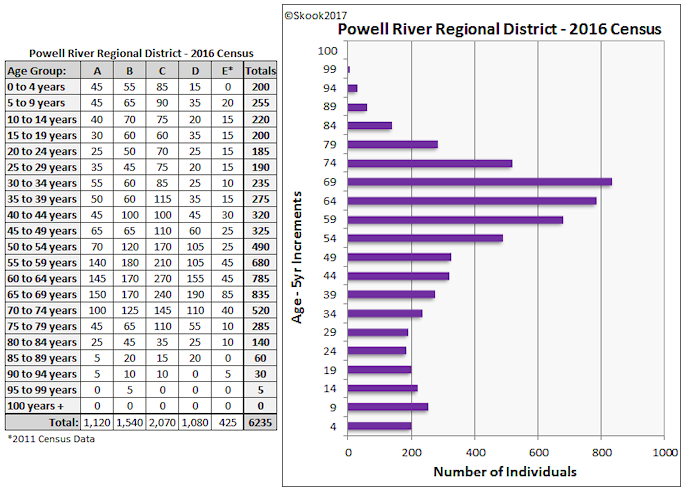 This should come as no surprise if all other regions show the same 2016 population pattern as the Powell River region. Finally, a few last thoughts to ponder. What percentage of the population age 65 and older is relying on the equity in their home to finance their retirement years? Will there be a sudden influx of listings in the near future and, if so, will there be enough buyers in the lower age groups to purchase those homes? The news reports I am reading has the nation already at 70% home ownership. 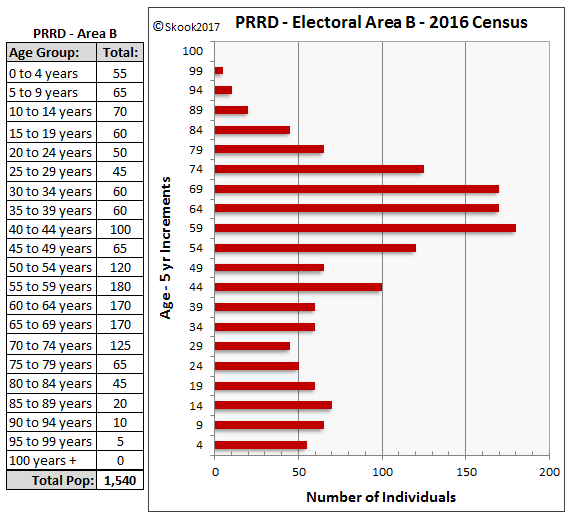 The 2016 Census results raise many critical issues as the CBC aimed to point out. Its interactive graphic can be found here.